XLR8 is an FPGA-based development board that has been specifically designed to look, feel, and act like a standard Arduino Uno board. The following steps will guide you through the process of getting your XLR8 board up and running. The first step in setting up your computer to connect and program the XLR8 is to install the standard Arduino IDE software. Follow the instructions below to install the Arduino IDE on your computer. If you are running Mac OS, you may run into issues with the usbserial port disappearing and not reconnecting. There are known issues between the factory installed Mac OS FTDI drivers and drivers available for installation from FTDI directly. And, unfortunately, the jury still appears to be out on which version of Mac OS will work consistently without ever seeing the lost serial port problem. At this point, XLR8 will function just like an Arduino Uno, and you can run an example sketch such as “Blink” to check that everything is working. You’re up and running with your XLR8 board! You can now use your XLR8 just like an Arduino Uno. If you want to take the next step and make use of the XBs preinstalled on your XLR8, continue with Section 3. To take advantage of the XBs that come with the XLR8, you’ll need to do a couple of things in addition to the above setup. 1. For Windows and LInux: Go to File > Preferences, in your Arduino IDE menu bar. 2. 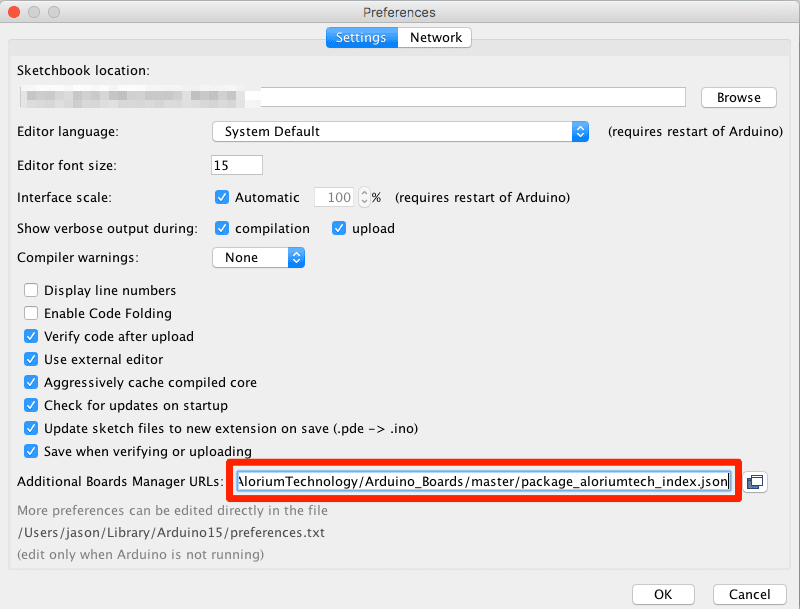 For Mac: Go to Arduino > Preferences, in your Arduino IDE menu bar. 3. Locate the ‘Additional Boards Manager URLs’ input field. 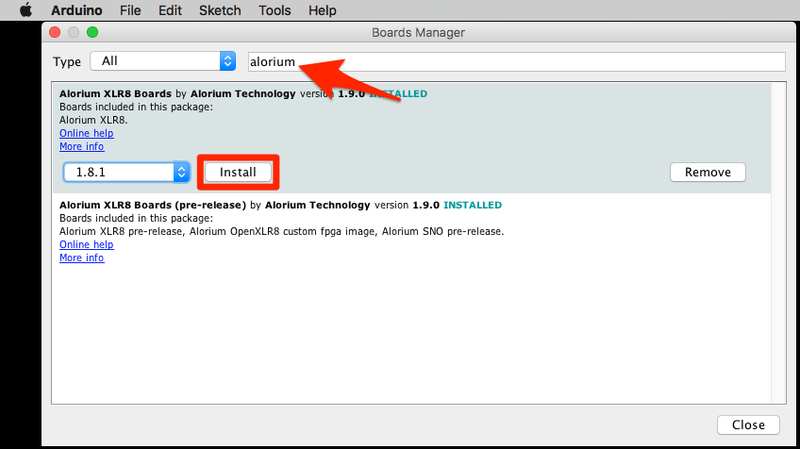 After loading the XLR8 board support, you’ll see a new section for Alorium XLR8 Boards when looking at the Tools > Board menu. Even better, after selecting an XLR8 board there, you will find a new menu item at Tools > FPGA Image, where you will find a number of FPGA images that provide different operating speeds and different XB configurations. Installing the XLR8 board support will also install a default set of libraries that are needed to take advantage of the extra capabilities of XLR8. You can see the libraries listed in the Sketch>Include Library menu. There are additional libraries available that can be installed using the Library Manager. In the Arduino IDE, go to the menu Sketch > Include Library > Manage Libraries, which will open the Library Manager in a new window. 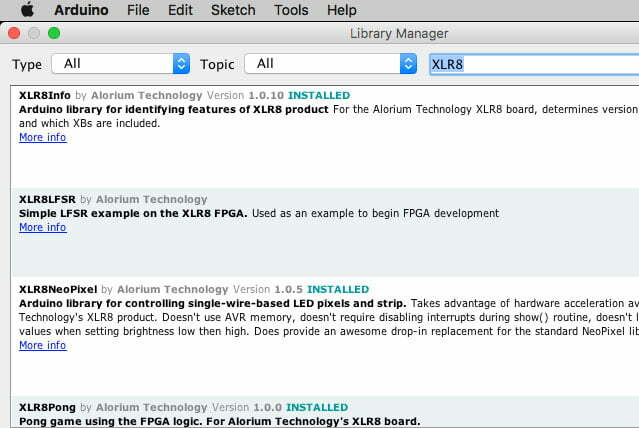 Enter Alorium in the search bar and you will find the entries for the various XLR8 libraries available. You will also find some examples sketches in the File > Examples menu, under the library name. Connect the XLR8 to your computer with a USB cable. You’ll note in the output from the XLR8Version sketch there is a pre-formatted URL to submit the results of the XLR8Version sketch. Please copy this URL from your Serial Monitor window and enter it into your browser! It will take you to our Registration and Board Info page so that you can both register as an owner and also let us know what board you’re using. This will help us support you in your use of XLR8. You’ve now got the ability to use the XBs that come preinstalled on your XLR8. Now you can make use of the Floating Point, Servo and NeoPixel XBs, by loading their libraries as well. FPGA stands for Field Programmable Gate Array, which means that the functionality inside the FPGA can be overwritten with a completely new set of functions, sort of like flashing your firmware. For the XLR8, we use this ability to allow you to swap out one set of XBs for another. 4.5 You are now an Expert! Congratulations! You have already gone far beyond what is possible with the Arduino Uno. Now start exploring all the other capabilities of XLR8. 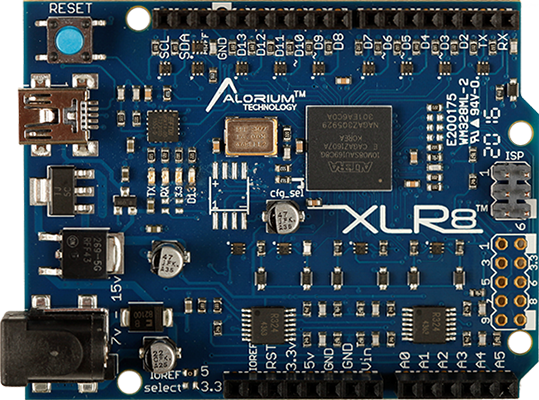 XLR8 is an FPGA-based application accelerator and development board that has been specifically designed to look, feel, and act like a standard Arduino UNO board. Installing the XLR8 board support will also install a default set of libraries that are needed to take advantage of the extra capabilities of XLR8. You can see these libraries listed in the Sketch > Include Library menu.